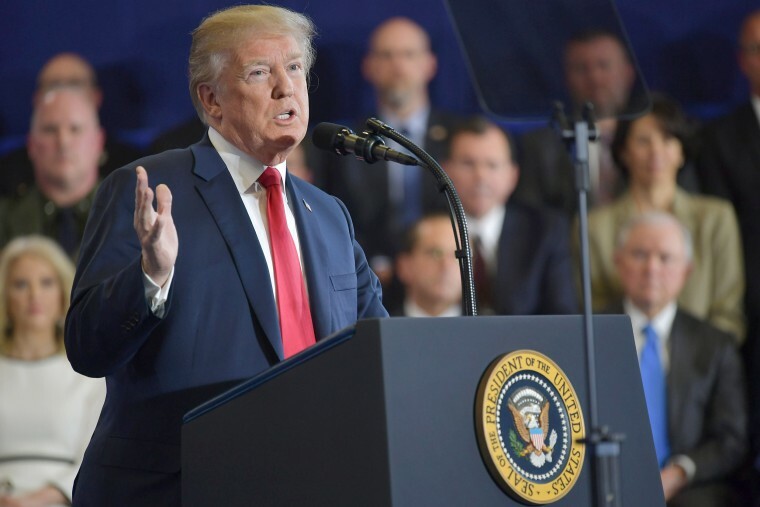 President Trump visited New Hampshire Monday to promote his new plan to fight opioid abuse, including the proposal of a capital punishment option for drug traffickers. MANCHESTER, N.H. — President Donald Trump announced new steps to combat the opioid addiction epidemic on Monday, pressing for "toughness" in punishing drug dealers — even if it means sentencing them to death. "If we don't get tough on the drug dealers, we're wasting our time," Trump told the crowd, some of whom shouted "yes!" in response to his statement, "That toughness includes the death penalty." Beyond harsher penalties for dealing and trafficking, including capital punishment for some offenses, the administration's new opioids plan includes funding educational campaigns in an attempt to reduce demand for drugs, promoting alternative medical treatment methods — with Trump calling for more research into options that are "not so addictive" — and combating the flow of drugs with increased border security. Building the wall along the southern border with Mexico will also "keep the damn drugs out," Trump said, blasting Democrats for linking negotiations about the fate of the Dreamers with the border, a top administration priority. But the president also targeted China as a source of the deadly drug fentanyl, letting the crowd know that he told both China and Mexico "don't send it." While the plan earned Trump, who declared the opioid epidemic a public health emergency last year, big applause from those gathered here, the reception on Capitol Hill is likely to be far less enthusiastic. It is unclear what legal basis the administration could use to seek the death penalty for drug trafficking — in a briefing call with reporters Sunday night, a senior administration official said it would be sought in "appropriate" instances, but would not provide specific legal precedents. Administration officials also have been unable to provide specific figures for funding levels want Congress to allocate, saying those conversations are ongoing. In the short term, $6 billion will go to combating the opioid epidemic in 2018. Monday's trip was the president's first to the Granite State since the 2016 election, though advisers denied the event in the first primary state was intended to serve as an early stop in Trump's 2020 re-election campaign. Still, the president saw the promise of future electoral victory at the gathering, remarking that there were "a lot of voters in this room" and saying he wanted to win the battle against the opioid epidemic by the end of his second term as president. Trump's speech, while focused on drug policy, also included riffs on his signature issue, as several in the crowd shouted for him to "build the wall!" and he attacked Democrats over their opposition to his immigration agenda. "They want to make (the immigration issue) part of the campaign," said Trump, referring to the midterm elections this year. Punishing "big pushers" with a "zero tolerance policy" works in other countries, Trump said, without citing those nations. He conceded that the United States might not be willing to embrace such a controversial step — even though he said he couldn't "personally" understand that way of thinking. Trump might seek to model the U.S. punitive program after the approach taken by countries like China and Singapore that have adopted capital punishment for drug offenses, a senior White House official told NBC last week. Both countries have been criticized for those policies by human rights groups. Trump told the crowd Monday that the Justice Department would focus on finding a way to implement the policy in the United States. "If we're not going to get tough on the drug dealers who kill thousands of people and destroy so many people's lives, we are just doing the wrong thing," Trump said. One of his key promises during the presidential campaign was the development of a comprehensive plan to combat opioid addiction — and in New Hampshire, he and other presidential hopefuls found a population eager to hear potential solutions: In 2016, the Granite State had the third-highest drug overdose rate in the nation. Trump — who on Monday praised New Hampshire's efforts to fight addiction — referred last year to the state as a "drug infested den" during a call with Mexican President Enrique Peña Nietor, according to a transcript of the call published at the time by The Washington Post. In that call, the president also claimed to have won the state because of voters' concern about its drug problems. Trump won New Hampshire's 2016 GOP presidential primary, but lost the state to Hillary Clinton in the general election.